Normally, I’d write up a book after reading the whole thing, rather than just a first chapter, but for this book, I’ve made an exception. I’ve mentioned a couple of times on this blog that I have a background and education in engineering. Studying and particularly expressing my opinions on art has been a challenge. So far, while I may have aspired to artistic work, my photography has remained in the comfort and familiarity of documentary. I, like other students starting out on the course whose blogs I’ve read, have occasionally struggled putting our finger on what art is and what makes one photograph art and another a happy snap. On Sunday morning, it was raining for the seventh consecutive day and so rather than getting out and shooting pictures for my second assignment, I turned to the course reading list and began Charlotte Cotton’s book. Three and a half hours later and I’d finished the first chapter! It’s not that I’m a slow reader, it’s just the sheer number of essential references and interesting leads that I ended up following. The book is a revelation! It feels that the opening chapter of this book may be the most important on the subject of photographic art that I have ever read. It explores the idea that a photograph can be viewed simply as a documentary recording of the scene, or as a conceptualised subject. If the concept is not something we understand, can engage in, are challenged by or indeed, interested in, the picture becomes simply the object photographed. Additionally, when the image has been shot simply, to concentrate our attention on the subject and concept, but we don’t ‘get’ the concept, we’re left with a photograph that makes no sense and doesn’t hold our attention. Often, contemporary photography is not about ‘virtuoso photographic technique’ (in fact often the opposite, again to concentrate attention on the act being captured) but at the same time nothing is left to chance. Artists will control all elements of the creation of the work but leave the interpretation up to the viewer. The result is a determined structure to the creation of the art followed by an unlimited range of responses to it. Based on our education, our imagination and experiences, each of us will have a different attitude and response to art. Using the examples offered by Cotton, things like Jeanne Dunning’s ‘The Blob 4‘ and Tatsumi Oramoto’s Bread Man creations are, in my view dangerously close to the line between art and people acting daft! Although Cotton tells us that strapping bread to his face and being photographed with his mother who has Alzheimer’s is ‘a visual merging of her changed mental reality with his performance of physical difference’, it leaves an uncomfortable feeling of exploitation. Another take that we are introduced to is Erwin Wurm’s. He photographs strangers, positioning them in absurd poses, claiming that his art is the original idea, not the resulting photograph or his own performance. This chapter also introduced me to the wonderful ‘Retail’ by Tim Davis. Fantastically crafted night time shots of urban America with corporate, neon signs reflected in the windows of houses. This work comments on intrusion of advertising. As Cotton points out, one of these images alone is interesting enough, but when presented as a series or body of work they really explore a concept – in this case, that commercialism is invasive and everywhere. I’m excited to get stuck in to the remainder of the book (especially the chapter called DEADPAN. My favourite work and the style I’m aiming for in my second assignment is very much this highly detailed but emotionless presentation) but will need to be careful that it doesn’t overwhelm me with references and research routes. This first chapter has addressed so many of my internal debates and I’d thoroughly recommend it to any fellow students starting out as I am and struggling with the issue of what makes art. I’m sure this is why it’s on the reading list. Read, read, read. 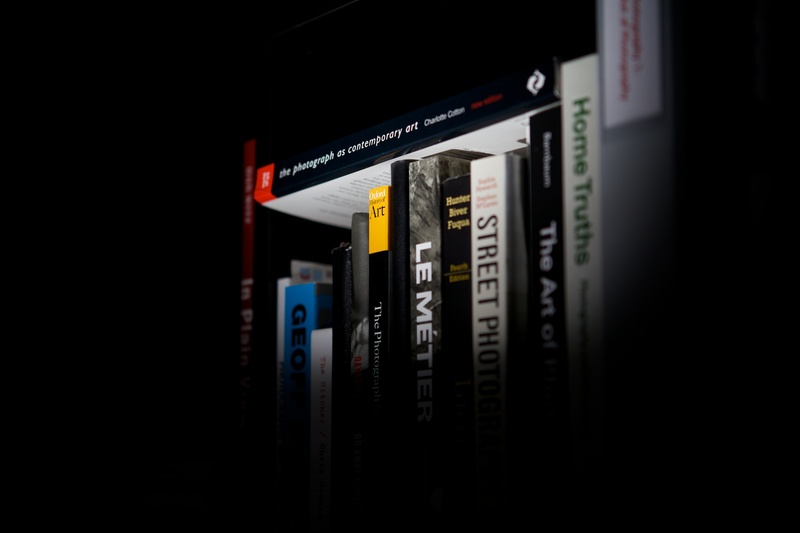 Forget studying photography – just go and study literature. Then you will bring something to the photography. From what I’ve seen so far, it’s worth tracking down if you can. I can lend it when I’ve finished although I may not want to let it out of my clutches. Another very inspiring book review – well done! I have just bought the book – that is next on my list! Thanks Alison – for people at our stage of the course, I think it is the perfect book to balance the technical guidance given by Michael Freeman with the artistic aspects we need to come to terms with. Great resource , I am finding it difficult to get engaged with the reading side of this course. Your review so far has got me interested in picking up a copy (if I can). I have yet to write up my two reviews of books I have managed to finish. Work is full on at the mo so have had to slow down on TAOP a bit, but putting assignment 3 together in next few days. Hi Ian, it is an interesting quote from Dayanita Singh. I find it interesting, because reading about other things than photography is what drives me photographically. And it is not an advice that you find often. I guess it depends, it probably does not work for everybody, but for me it did. When doing TAOP, I was constantly forbidding myself to look at other things than photography, thinking that I should totally focus on it. But around assignment 5, I realized that it was not my way of doing, and I completely surrender to my own personal inclinations, and inspiration and it worked well.